Hastings United's footballers were held to a frustrating 1-1 draw at home to Sittingbourne tonight (Tuesday). Both sides remain unbeaten in Ryman Football League Division One South with nine points from five games, but the visitors would certainly have been the happier at the final whistle. United had the bulk of the play and chances, and couldn't really have done a great deal more than did to conjure up a winner, but it wasn't their night. The opening stages were open and end-to-end. Jay May couldn't direct a header on target for United and moments later at the other end home goalkeeper Lenny Pidgeley had to beat out a Connor Wilkins shot. Sittingbourne took a 14th minute lead with a disappointing goal from United's point of view. United midfielder Wayne Wilson lost possession midway inside his own half and Wilkins drove forward before firing into the bottom corner. United responded positively, though, and pinned their opponents back throughout the second quarter of the contest with some good passing football. Sam Cole headed home from a Frannie Collin cross only to be denied by the offside flag and Collin's firm drive from 25 yards was beaten away by Sittingbourne goalkeeper Ben Bridle-Card. United deservedly levelled with a nicely worked goal in the 39th minute. May threaded a neat ball through to Cole, who squared for Collin. Although Collin's first effort was well blocked, he fired home at the second attempt with the aid of a deflection. Without playing quite as well as they had in the latter part of the first half, United had much the better of the second period on a warm September evening at The Pilot Field. Bodkin brought a good low save out of Bridle-Card having been released by a lovely ball from Wilson shortly before May's shot from a dangerous position in front of goal was blocked. May later forced Bridle-Card into an awkward stop with a powerful low drive from outside the box, and the away goalkeeper subsequently palmed away decent 25-yard strikes from Reece Butler and Sam Cruttwell. In fairness to Sittingbourne, they did a pretty good job defensively and had plenty of pace on the break, although United were effective at snuffing out counter-attacks. Pidgeley made one comfortable save from the jet-heeled Stefan Wright. United had all their attacking players on the pitch in the closing stages and May had another effort blocked from Harry Stannard's knockdown. 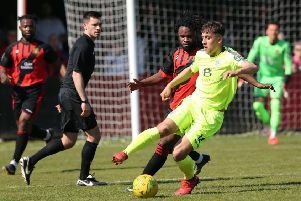 The best chance came right at the end when Collin's downward volley seemed destined for the net until Sittingbourne defender and former United player Jono Richardson came to his side's rescue with a brilliant header off the line. United: Pidgeley, Butler (Temba 90), Cole, Wilson (Stannard 72), Rowe, Davies, Cruttwell, Johnson, May, Collin, Bodkin. Subs not used: Smith, Black, Nicholls. Attendance: 303.